“The best part of my day is working with patients. I want both patients and parents to be informed about the treatment and spend time during the appointments to discuss what happened that day and what to expect next time. I am passionate about getting the best possible result for each individual patient. I enjoy hearing about what is going on in my patients’ lives outside of the office and discovering their unique personalities. Dr. Jared Blacker received his Doctorate of Dental Surgery (DDS) from the University of North Carolina School of Dentistry, where he graduated with distinction. He continued his education at UNC-Chapel Hill and received his Master of Science in orthodontics. The Chapel Hill residency is widely considered within the profession to be one of the top orthodontic programs in the country. While there he was mentored by Dr. William Proffit, and was able to make contributions to the fourth edition of his textbook, Contemporary Orthodontics, which is the most extensively used textbook on the subject of orthodontics in the world. Dr. Blacker greatly enjoyed his time in Chapel Hill, especially when he was able to see Tarheel basketball in action! Dr. Blacker is an active member of the American Association of Orthodontists and the American Dental Association. He is also a member of state and community dental societies. Dr. Blacker pursues continuing education throughout each year to ensure the treatment he recommends is current and effective. Dr. Blacker grew up in Idaho, but after spending time in Chapel Hill, both he and his wife fell in love with the climate, the natural beauty of the mountains and ocean, and especially the people of North Carolina. He is active in his church and enjoys working with various community organizations. 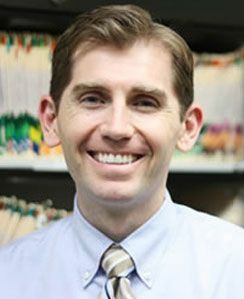 Dr. Blacker, his wife, and their children recently moved from Concord, North Carolina to Phoenix, Arizona to be closer to family. He enjoys reading, following the Tarheels, exercising, and making homemade pizza every Saturday night for his family.